“Economic efficiency” in the use of natural resources without concern for the justice of its distribution, or the scale of its extraction is just bad fiction, just like the story of the internalization of externalities. Hopelessly, the exploitation of the Amazon has always entailed a process of dispossession of those whose existence doesn’t count for capital. 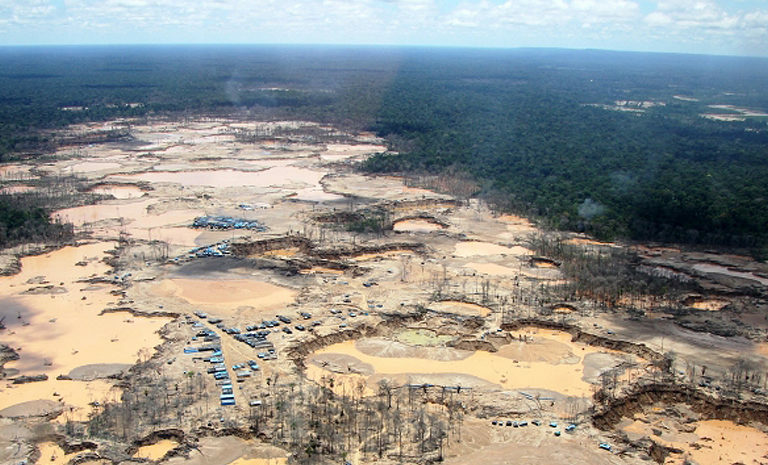 Deforestation and gold mining in the Amazon rainforest. Source: news.wfu.edu. When we think about impossible events, we tend to use the imagination as playfully and widely as possible. Thus, we ramble on fantasies, crazy ideas, and assumptions. But at times those impossible stories happen and sooner or later reality surpasses fiction. Like on that distant day, in 1519, when Cortez met Moctezuma, or when the humanity was watching the moon landing, open-mouthed, exactly 450 years later. Many of the socio-environmental conflicts we have witnessed throughout history have shown us that when these “impossible stories” happen, unfailingly, new scenarios arise. The day the now extinct tribe of the loneliest man on earth realized that the place they inhabited was sought-after by many, the scenario of their own existence became truly uncertain and threatened. Since the white man crossed the seas to find a whole new world of incommensurable lands, strange animals and “naked wild men“, the Amazon rainforest became one such place in his mind, where “real and magic” coexisted. Then, slowly, the crucifixes, epidemics, religion, and the eternal hunger for Amazonian treasures made that new “magical world” disappear. That space of “fiction” began to be measured, worked and exploited. First was the rubber, displacing and killing the Yine, Piro, Haramkbut, Mashco and Ashaninka populations and whoever else got in the way. Then came all kinds of fevers, mining (legal and illegal), hydrocarbons, forestry, agriculture and livestock. 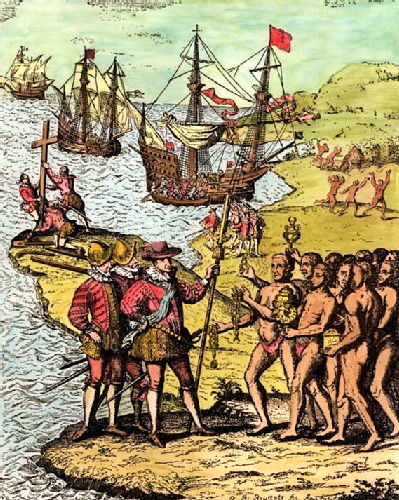 Facing the Other: European Encounters with the New World. Source: warwick.ac.uk. If 50 years ago we would have asked the Munduruku Indians, ancestral inhabitants of the middle and upper reaches of one of the largest tributaries of the Amazon, the Tapajós River, about how they imagined their land in the future, it probably would never have occurred to them that the Brazilian government would one day seek to open in the Tapajós basin an area the size of France to facilitate trade with China. For long time relegated and forgotten, the Munduruku Indians are nowadays seen as the only obstacle to connecting farms on one side of the Atlantic with Chinese tables and diners on the other side of the world. 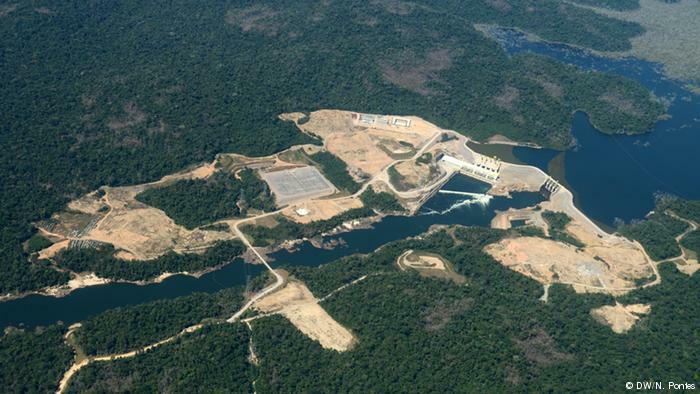 Building 49 dams on the Tapajós and its tributaries is supposed to help create the largest river road in the world for the transport of soybeans, and at the same time increase Brazil’s electricity supply by 25%. “Only” 950,000 hectares of forest would have to be cut down for this endeavour. Of course, there is nothing novel about this type of megaproject. In 1966, a plan to occupy and develop the Amazon created the Superintendency for the Development of Amazonia (SUDAM) and the Bank of Amazonia, encouraging individuals and companies through soft loans to invest in projects within the region. At the beginning of the 1980s, the World Bank and various foreign financiers implemented the Carajás Grande Project (PGC) and the Northwest Development Pole (Polonoroeste). The PGC involved US$61.2 billion for the construction of extraction, processing and export facilities in what would turn out to be the largest iron ore mine in the world. At US$1.5 billion and with a contribution of 500 million dollars from the World Bank, Polonoroeste was a considerably “cheaper” project, which sought to pave the famous BR-364, the key highway in Rondônia and Mato Grosso, which caused a massive influx of population and an exorbitant increase in deforestation. This road has also produced what is known as the “fish bone effect”: you build a main road, and on both sides byroads start illegally entering the territory, with people putting their houses, their crops, their shops, etc. Perhaps nobody had thought about it at that moment, but the BR-364 meant the beginning of the end for the family and tribe of the loneliest man on earth. During the economic crisis in the late 1980s, the state was forced to paralyze bank assets, prohibiting withdrawals to prevent capital flight. Capital for land purchases in the Amazon became scarce, which significantly reduced deforestation. With the stabilization of the Brazilian economy and the reduction of inflation, and thanks to the “Real Plan”, new investments increased the prices of land in the Amazon, leading to a renewed peak in deforestation in 1994-1995. These fluctuations reflect the correlation between the provision of capital and the increase in deforestation. But, the Tapajos project, perhaps fictional in our and the Munduruku eyes, is just a symptom of deeper, systemic processes. Over the las 10 years, China has developed around 600 megaprojects in various parts of the world, including dams, pipelines, roads, power plants, railways, etc. Yet, not simply because of good faith and healthy trade relations. There are obvious geopolitical and financial reasons, a whole agenda aimed at gaining new “friends” and improving China’s position in the endless run for power and control. The Teles Pires dam on the homonymous tributary to the Tapajos River. Source: dw.com. Of course, there is also the latent fact that megaprojects are carried out because they are highly profitable. The Tapajós project is the latest proof of this. In the medium term it will be almost impossible to resist Chinese capital and the lobby of the powerful agro-business industry in a global system oriented towards the growth of consumption. It is what some call the Yangzification of the Tapajós. And we should not forget that all the projects carried out in Amazonia happened because there was available capital, and capital, as its own nature and history have shown us, seeks to reproduce itself, always. If that implies depriving indigenous people on the other side of the world of their means and ways of life, what difference does it make? As geographer David Harvey suggests, in the 21st century, primitive accumulation processes are more real than ever. Many neoclassical economists support the current format of extraction and utilization of natural resources in the Amazon rainforest and elsewhere, in the name of “efficient allocation of natural resources”. I ask myself, honestly, what has this idea done to the Amazon’s ecosystem services and its inhabitants? What does an “efficient” allocation of natural resources mean? Deliver them to the one with the highest economic valuation in a market frame? Economic efficiency in the use of natural resources without concern for the justice of its distribution (good and bad) or the scale of its extraction is just bad fiction, just like the story of the internalization of externalities. About 1,100 kilometers distant from the Tapajós and the river road megaproject, in the Tanaru reserve of Rondônia, lives the loneliest man on earth. He has the habit of digging large holes to hunt animals or to hide from strangers. He is about 50 years old and is believed to have lived alone for 20 years. He is the only survivor of an exterminated tribe and nobody knows his native language. After several attempts of murder by cattlemen, the Brazilian government decided not to try to contact him anymore, and to expand his territory to 3,000 hectares so that he has more space to live. When he was just a child, the loneliest man on earth probably never imagined that his fate would be wandering completely alone through the jungle. A bad fiction turned into a worse reality. The most solitary man on earth knows perfectly where he lives and the points of no return of his jungle, but his knowledge does not count at all in calculations of how to “develop efficient green and sustainable projects”. The loneliest man on earth. Source: Acervo/funai.gov.br. Chico Mendes, the founder of Brazil’s rubber tapper movement also knew perfectly the limits of the jungle. Only a couple of years before receiving that cowardly bullet in his chest, he decided to travel to the United States to denounce the World Bank and the IDB, the main funders of the Amazon’s destruction. It was when he confronted the banks that the value of his head began to have a price. The loneliest man on earth was irrevocably dispossessed of his people. The cause is something he cannot see or face, but it is always there, ready to go on engulfing what it needs to grow, whether these are Amazon jungles, Southeast Asian forests or entire tribes.